NEW YORK (AP) — It's not the kind of performance that will win her another Academy Award, but Tilda Swinton certainly has them buzzing at the Museum of Modern Art. But keep it down, please. She's trying to sleep. The "Moonrise Kingdom star has been engaging in a different kind of performance art. She's presenting a one-person piece called "The Maybe," in which she lies sleeping in a glass box for the day. The first performance was over the weekend, and the museum won't say if there's a schedule for when exactly it will come back for six other performances. On Monday, the display drew a line of spectators that wound through a whole second-floor gallery into a museum hallway. Erwin Aschenbrenner, a bemused German tourist, said it "just what you'd expect to see at MoMA." The actress "is so pale and not moving in there that she looks like she's dead," said Robbie von Kampen, 20, a philosophy major at Bard College, north of New York City. But after about seven hours a day of the shuteye pose on a white mattress in the glass box — with only a carafe of water and a glass to get her through — Swinton can stretch and walk off into the Manhattan night. But only when spectators leave. "This makes me think about myself, looking at her," said Quinn Moreland, 20, also a Bard student, majoring in art history. "You don't usually get to stare at somebody like this; it makes me self-conscious," she explained. Added von Kampen, "Yeah, it's socially unacceptable — it's kinda creepy." 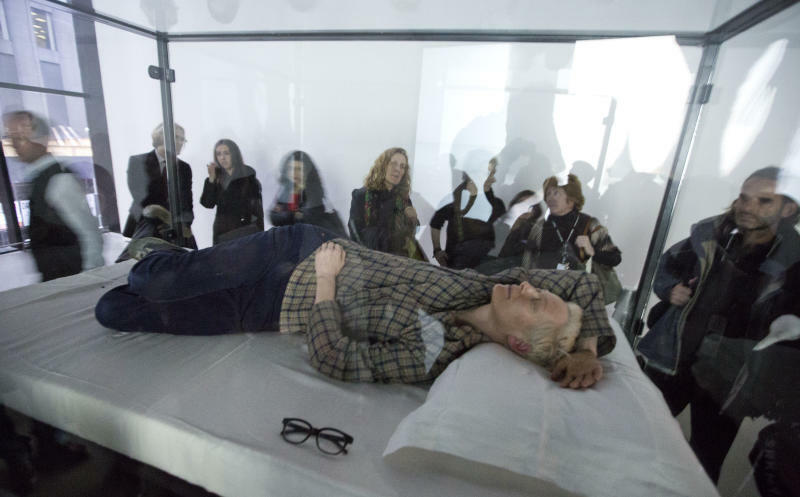 No one, not even museum curators, could say whether the thin, mostly immobile Swinton is actually getting some sleep while people stare at her. At least Swinton was comfortable. She wore a pair of grubby sneakers, dark sporty slacks and a checkered shirt. Her glasses lay on the mattress. But no snacks were in sight. And none could be offered in the closed chamber. 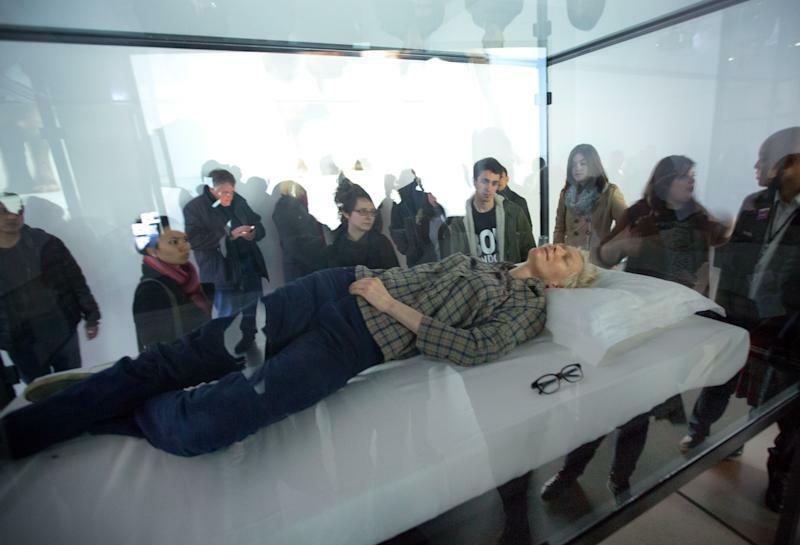 Swinton also starred in a glass box in 1995 at London's Serpentine Gallery — seven days, eight hours a day — in an exhibition seen by 22,000 people. The next year, she repeated the spectacle at the Museo Barracco in Rome.